Even with no central heating, you can benefit from the beauty of a cast iron radiator. 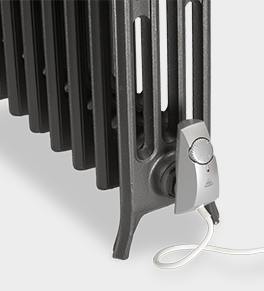 Our electric only operation cast iron radiators are fitted with a 240V single phase heating element which has thermostatically adjustable settings including a frost protection mode, or we also have a Radio Frequency controlled version (Home+ system) for single or multiple radiators which, when used with the fully programmable controller offers timed and temperature operation for your radiators. Our electric radiators are supplied filled, tested and ready for wiring to a fused spur (standard lead length is 1200mm). 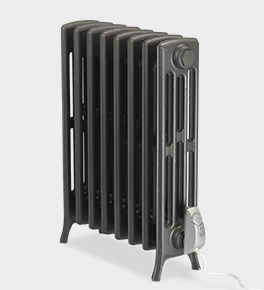 Our electric cast iron radiators are available in a range of sizes. It is also possible to supply radiators with two elements (one at each end) when more significant outputs are required. White, Gold, Satin Silver, Steel, Anthracite, Matt Black, Gloss Grey, Textured Grey and Textured Dark Grey. Cables are white as standard but on request black, gold or light grey cable can be supplied.